Technology giant Apple sent out invitations Monday for next week's press event. Invite contains only a short message: "Come see our latest creation"
(CNN) -- It's official: Apple Inc. will host a much-anticipated press event January 27 in San Francisco, California. Tech insiders expect the company to unveil a touch-screen "slate" computer, which would look something like a giant iPhone. Buzz about such an announcement, and the possible press event, has been dominant news in the tech blogosphere for months. The invitation to Apple's event gives only a cryptic message about what news will come, however. "Come see our latest creation," says the invite, which was sent Monday by e-mail. 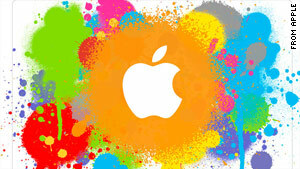 The e-mail invitation shows an image of bright colors splashed around an Apple logo. It does not show photos of products or specify what products Apple will discuss at the event. The press event will be held at San Francisco's Yerba Buena Center for the Arts at 10 a.m. PT on January 27, according to the announcement. The amorphous "slate" and "tablet" computer categories have drawn much attention from technology writers and the public in recent months. Some companies say the devices -- which fall in size and function somewhere between smartphones and laptop computers -- are good for reading books, sorting through photos and browsing Web sites. Others have criticized these emerging computer categories as overhyped. Apple has a history of game-changing product announcements. The Cupertino, California-based company also has a reputation for being tight-lipped about its plans. The company has not commented on the frenzy of rumors about its supposedly upcoming tablet computer.